Ahem. You remember all those posts I wrote about creating my own comics and doing more art? Well…that’s being put on hold for a while. I would love to get good at drawing. I would love to complete comics. Yet, I don’t have the motivation for it lately. I know I must practice drawing to get good at it, and I would love to be as good as other artists I’ve seen, yet I suppose I’m not currently willing to do what it takes to get to their level. I also don’t seem to have the motivation to continue my comics. Perhaps I will return to these things someday. I really should. But, for now, the Duck must take a break from them. You see, my original love was writing. I always wanted to be an author, not an artist. If someone could snap their fingers and make me an artist, I’d do it. Yes, please! I love beautiful art and wish I could make it and probably could if I kept trying. Nevertheless, right now, I have returned to writing, and it feels like less of a chore. I know people shouldn’t give up on things, but at the same time, if you don’t enjoy what you’re doing, should you keep doing it? Perhaps not. Lately, I have not enjoyed drawing or working on my comic (even if the end result is something I would really like, if only the process to get there wasn’t so tedious), but now that I have returned to writing, I have enjoyed doing it so much more than my other projects. And so it may be time to focus on writing again. I have so much more of a knack for writing than drawing, it seems. It comes much more naturally and easily, especially after I began writing fan fiction again several months ago. Drawing is hard. Drawing is really hard. And I work and work at it, and it never turns out that good, and I don’t have fun doing it because it’s so difficult. It’ll only get easier the more I do it, but until then, it’s more a pain than anything, and that’s not how you should feel about your passions. For me, writing is easy, which makes it more fun, and I have been improving much more quickly in it than I have been in my art. Just over the last few months, I have noticed huge improvements. I write a chapter in my notebook, then, when I get around to typing it, I can think of so many new ways to make it better. It’s such a satisfying process watching the pages fill up with words, then fixing it up paragraph by paragraph until it’s so much better. I have fun doing it, and I have fun looking at what resulted from my work. And so, to make a long story a bit shorter, I have decided I would really like to pursue my writing seriously this time. I have given half-hearted attempts to write and get something published in the past, but starting fan fiction again has reminded me how badly I wanted to be an author and how much I used to love to write. In fact, not long ago, I had this dream that inspired a story. Currently, I am not disclosing the details of this story, but it is honestly one of the best original story ideas I have ever come up with. Not to be unrealistic and in fantasyland, but I really believe that this story stands the greatest chance of being published of any other idea I’ve had so far. Seriously. I really think it can make it, but it all depends on if I can pull it off. I don’t know. Maybe I can. Maybe it will fail and will sit in a drawer for years until I can take it out and make it better, until it’s good enough for a publisher to take it. But, I really think I can do it, even if I can’t do it right now, but someday. But, I can’t give up like I did on my art. It is hard to succeed in everything, and if I am to get anywhere with my dreams, I really must narrow them down to a select few. I have chosen writing. Art can come later if I so choose, but I want to be a writer again. I want to go after my goal full-steam this time. I don’t expect to get rich. Or famous. Or publish a whole lot. But I want to publish at least this one thing. And maybe I’ll turn my two comic stories into novels, as well. Maybe I can’t turn them into comics, but perhaps I can make them into something I’m better suited for. So I’m doing it again. I never tried very hard to be published before, but I really want it, more than ever this time. I just have to go for it. It’s impossible if I try so half-heartedly as I have been. But, it’s quite possible if I really try with all my might and do whatever it takes. Wish me luck. Okay, and if you’d like some hints about my story (unsure if it will be a short story or a novel), it’s a horror story. That’s right, horror. Normally, I do fantasy or science fiction, but this time, it’s horror, but not about monsters. It’s about the human mind. And the monsters in our own head. Then again, is it about monsters? You’d just have to read it to find out…. Recently, I wrote a post about how I missed doing fan art, due to the fact that my comic was taking up much of my Photoshop time these past few months, and will continue to possibly for years. So I’ve been drawing pictures the old-timey way, on paper, then, scanning them into the computer. But, that hasn’t been quite enough, either. For some reason, I’ve been feeling quite a void in my tummy. Partly, I’m just hungry. But, I think it’s also being caused by something else. I’ve been reading quite a lot of “Jak and Daxter” fan fiction lately. And I finally decided doing just fan art wasn’t enough. These stories are making me want to bring my favorite characters to life through more than just little doodles. And then I was suddenly struck with a big bolt of inspiration. I had an idea! In my soft, oozing brain meats! I had this idea of a story about the main villains from “The Precursor Legacy”, Gol and Maia. These two had likely once been good people, but they were twisted by prolonged exposure to Dark Eco and made into wicked people that wanted to open the Dark Eco silos to flood the world with the stuff and reshape it. They were then trapped in the silos by our hero, Jak (not assisted in any way whatsoever by Daxter). While the two have still not returned officially, it is still rumored that they survived and could eventually come back. This has caused many people to write stories about their return. As will I. But, I don’t want to write just another story where they return, cause lots of trouble, then get killed, as entertaining as those are. I want to take a new direction and explore their past selves more and any chance that they can change and become the people they once were, if that is even possible and if they would ever do such a thing if given the opportunity. So as is often the case, while bathing in the nearby duck pond, all these ideas floated around in my head, not unlike me. In that pond. The story began forming before I had a chance to get paper. And so as soon as I could, I started to write the prologue. And then I went on to write the first few chapters. So far, this chunk of the story isn’t too dreadful, either. I had learned not super long ago all kinds of skills for writing in a more literary style, and I think that helped me a lot. If I do say so myself, and I obviously do, I think it’s not bad. I found out when I asked my mom to take a look that my handwriting is indecipherable to all but me (it seems I have invented a new system of writing; I’ll call it the ducklabet), but once I read it aloud, she seemed entertained, despite the fact that I read largely in a monotone out of discomfort reading in front of others. Of course, she had to like it, as parents are compelled to like what their offspring create, but still. So I recently started an account on fanficion.net (the greatest fan fiction site there ever was, is, or ever will be) under DuckofIndeed. And I know this would appeal to a very small audience, but I ask that anyone who likes “Jak and Daxter” fan fiction take a look at my story. It will be going up in bits and pieces. I have also posted below the beginning narration from my story, before the characters show up, where I described some stuff in the most marvelous manner I could muster. Mustard. Yum. Please take a look and tell me what you think. Fortunately, my typing is much better than my handwriting. Far, far out in the Wasteland was a place few dared to go, even the Marauders and citizens of Spargus, who possessed spirits toughened to leather by the harsh life of the desert. This particular place had been forest once, centuries past, but the innumerable sands of the Wasteland had finally crept even here and swallowed up all the trees. Now, little stood there but dead pillars of wood, the remains of the trees whose roots had been choked with sand, and dunes that were gradually eroded away by the wind to only be built up elsewhere. And something else. Something else stood in this particular section of the desert and was the reason the people of the Wasteland did not tread here. Several large pillars, once hundreds of feet high and now made considerably shorter as the sand built up around their bases. They were of varying sizes and of bronze Precursor metal, showing signs of wear, but less than expected from their treatment over the years, though with much of their original shine gone. The Dark Eco silos. These pillars always filled all who saw them with dread, and who could blame them? These pillars, built possibly thousands of years ago by the Precursors, contained the majority of the planet’s Dark Eco. Such a substance needed to be contained. While it had existed as long as any other kind of Eco, this variation was dangerous. It twisted all it touched, turning all who were exposed to it to something no longer quite human. Or simply killed them. The dark bubbling ooze meant death or worse, and it couldn’t be allowed to coexist with the fragile life of this world. That was why the Precursors banished it away to the confines of the silos. But, for some, it also meant power, and that was why, long, long ago, two people tried to open the silos. To take that Dark Eco and use it to reshape the world. They tried to play God, and they were punished for it. And that brings us to the other reason why this was such a feared place. Centuries ago, those people had been locked away in those same pillars they had so desperately wanted to open. Some thought them dead. Some had their doubts. And the rest, well, they had forgotten the two had ever really existed. Their story had turned to legend for a time until so many years had gone by that no one believed any longer that it had ever happened. They were eventually reduced to monsters parents used to scare unruly children. In fact, few remembered anymore that they were even human. Even fewer knew what kind of people they had once been. Centuries ago. I hope that encourages people to stop on by fanfiction.net and continue the story. Yes? Yeeeeesss? Please, it’s been a whopping 24 hours, and I have no reviews! Why must life be like this! Just a poem illustrating my experience with feeding seagulls. A little while ago, I decided to join the Raywiki. It all started when I grew tired of playing “Rayman 3” for eight years while still not knowing what the characters were saying, so I started looking for a script. But, I never found one. I only found a page on the Raywiki that had some “Rayman 3” quotes, but not that many. 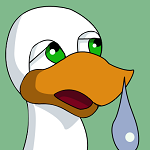 Driven to madness, the duck decided it was time to listen extra hard and figure out these quotes myself. And while I was at it, I may as well list them on the Raywiki for everyone else to see. Does my kindness know no bounds? So I listened, and I listened. After straining my ears and my mind, I finally started to understand what the characters were saying. I don’t know why I didn’t do this before. Then, I was faced with a new challenge. Learn how to create a Raywiki account. The web site did not want me to log on. Time after time, I would charge at it and be tossed back like a toddler trying to do battle with a sumo wrestler. After quite a bit of effort, I spotted a sign of hope on the horizon. I mean, I saw the word “Register” in the forum. And alas, my account was created. Oh, glorious day! So I compiled dozens of pages of quotes in my notebook, then I typed them on the Raywiki. Check it out. Not to be arrogant. Not to be a bragging jerk. Not to be a scumbag, but it is with 100% honesty when I say that most of the quotes were the ones I added. At least, for now. I’m pretty proud of what I did. It’s not often I make a contribution to society. But, when looking at the rest of the Raywiki, I have done next to nothing. I’m trying to help here and there. Little bits and pieces. A link here, a sentence there. I did write much of this page, the one on the dreaded, glitch-containing Pirate’s Treasure level that plagued me in “Rayman Origins”. I was excited to see a page I could do. Hooray! I also wrote a few more pages on other “Rayman Origins” levels, and I also added some “Rayman 2” quotes. I want to be useful. Hopefully I am, even if just a little. Anyway, I’m pretty excited to see what I can contribute. I’ve never worked on a wiki before. And if you don’t mind, check out my user page. I thought some of it was rather funny. Great, now I sound like a creep again. I am done with the script of my Artist comic! It took three drafts. The last draft only took about a week. I’m going to work more on my June comic before I start the drawing, and in the meantime, I must work on designing a few things. I pretty much know what the two main characters look like, but I have designed little else. I also need names for the characters. I’ve been calling them MG (for main girl) and B (for bird) all this time. I think I may name MG Margo, but I still can’t think of a name for the bird. Anyway, the comic is five issues, and it has a fairly simple plot, which made it easy to write. It is about Margo (age 15, I think) and a Muse (a colorful bird) that set out on a quest to bring the color back to their black and white world. I really like the two main characters. Margo is sweet and naive, and her bird companion is a bit cheeky. He was a lot of fun to write dialogue for, and I think the characters complement each other nicely. It’s exciting to finally be completing one of my biggest projects ever. Well, part 1, at least. The drawing may take quite some time, but I plan on getting it done, even if it takes a while. I don’t know if I’ll try to publish it in the end or just put it on the blog or what. I guess I should find out within the next twenty years. But, hopefully a lot sooner. 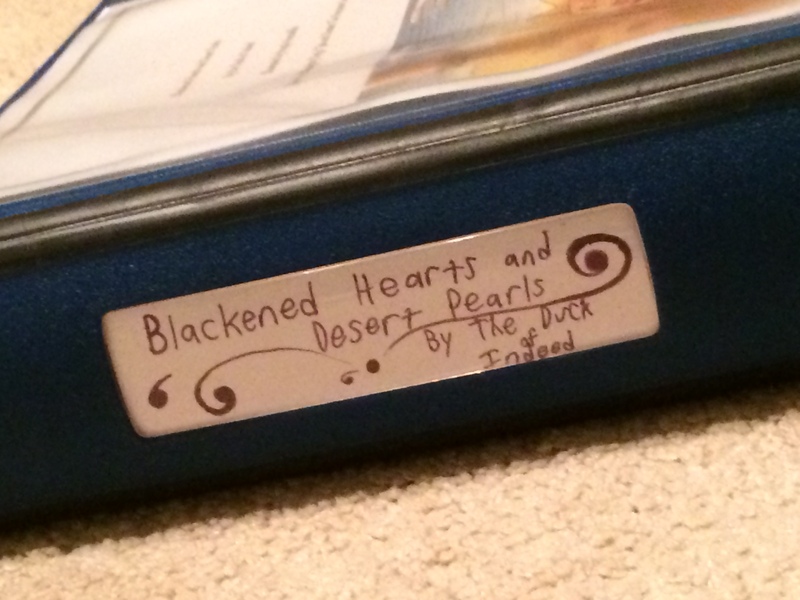 Behold, the duck is done with draft 3 of my June comic. It took one month. The script originally started as separate issues in draft 1, then, somehow turned into this horrible mutated mess where I couldn’t tell one issue from another in draft 2. And it was no longer chronological! So for draft 3, I first got lots of little pieces of paper and put a scene title on each one. Then, I moved them around until they were in the order I wanted. Kind of weird, but I think it’s helpful to do it that way. Then, I broke it back up into 9 issues and started rewriting it all and adding in scenes that really needed to be there. I had the most trouble with issues 4 and 6-9, but I worked extra hard on them and made them much better. Now the whole story is pretty much there. Now my script is nearly done. Some issues are pretty much done and some need extra help, but overall, I’m close. Issue 4 is kind of weird, though. I could almost cut it out, but there’s just enough good stuff that I need to keep it. And issue 8 is a bit of a mess, and issue 9 is too short. Hmm. Maybe I can squish it into 8 issues. But, I’ll save that for draft 4. I’m tired of this comic right now. I hope to be done by the end of draft 4 or 5. I have already fixed up issue 1 and 2 of my June comic, and I am quite proud of myself. Usually in large projects such as this, I give up before draft 1 is done, or if I finish writing the first draft, I never put much effort into fixing it. Unfortunately, now things are becoming more difficult. I made some huge changes to the story, and I find them rather okay, but now I need to fit them into the story. Issue 1 was easy. It’s the beginning. I think I have a pretty decent issue there. It needs fixing, but it’s there, at least. Next, issue 2 needed help. I made some changes. It’s okay, though. The beginning of issue 3 might be okay, but after that, I don’t have a clear picture of where the story goes. There’s a lot of pointless action I put in there, pretty much as a placeholder, that adds nothing to the story. It will either need major changes or to be cut from the story completely. So with my new ideas, I must figure out how to actually write my improved plot. For now, I’ll skip ahead to the most important scenes and write them first. I know certain things need to happen, but not what leads up to them. I can put in the rest later, I guess. I have a lot more conflict in June, I’m making the Philosopher more important (as he was meant to be all along), I’m revealing an important character later on instead of in issue 2, and there will be more of Flynn and Gretchen and the Scientists because they seem interesting. I changed the timeline a bit so that the conflict escalates throughout the story, rather than staying flat throughout much of it. Maybe this will end up being the story I dreamed it would be. Wouldn’t that be spiffy? By the way, I very much appreciate the help of my awesome commenters a couple posts ago. I’ll be sure to make use of your advice.